Pacifica, CA--- Pacifica may seem like a sleepy coastal town, but if you were to part the curtain of fog, you would find a community that boasts a treasure chest of creative arts. Art Guild of Pacifica is one of the finest jewels in that chest. Art Guild of Pacifica has encouraged fine art in the community for almost 55 years with a year-long array of shows, reaching its pinnacle with the 54th Annual Membership Show. The Membership Show opens on Friday, October 12, 2012, with a reception from 7:00 to 9:00 p.m. It features live music, something to nibble, wine & beer, and notably the work of last year’s Exhibition Award winners Amanda Boehm-Garcia, Denny Holland, Cynthia Rettig, and Janine Stegmaier presented simultaneously in a group show. This year’s Membership Show will be juried by Pacifican Tim Berry, an accomplished and widely respected artist who is on the faculty of both San Francisco Art Institute and University of California Davis. The action happens at Sanchez Art Center, 1220 Linda Mar Boulevard in Pacifica. Sanchez is a non-profit center that provides free art exhibitions, lectures, arts education, and artist studios to the community primarily through the use of dedicated volunteers. The four award winners from 2011 who are featured this year are accomplished artists offering something indicatively special with their work. Most profoundly affected by her mother’s disability, Amanda Boehm-Garcia’s work strives to bridge the gap of human understanding perceiving beauty in the disabled. Denny Holland encourages the art enthusiast to explore the thin line between realism and abstraction with a new series of water and wave paintings. Cynthia Rettig explores the many facets of human nature with her photography, particularly the “hierarchy of human above the natural world” (as she states). With a figurative group of sculptures and paintings, Janine Stegmaier focuses on the tragedies of Haiti while celebrating the resiliency of its spirit. These winners were selected by Shannon Trimble, Gallery Manager of the recently closed Braunstein Quay Gallery, and who is currently with Gallery Paule Anglim in San Francisco. 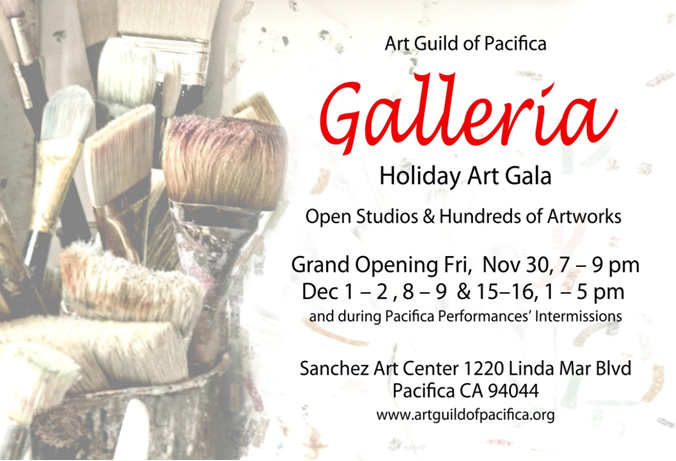 The work of these recognized and talented artists along with the Art Guild members participating in this year’s Membership Show at the Sanchez Art Center is a joyous celebration of the artistic talent that thrives in Pacifica’s coastal community. 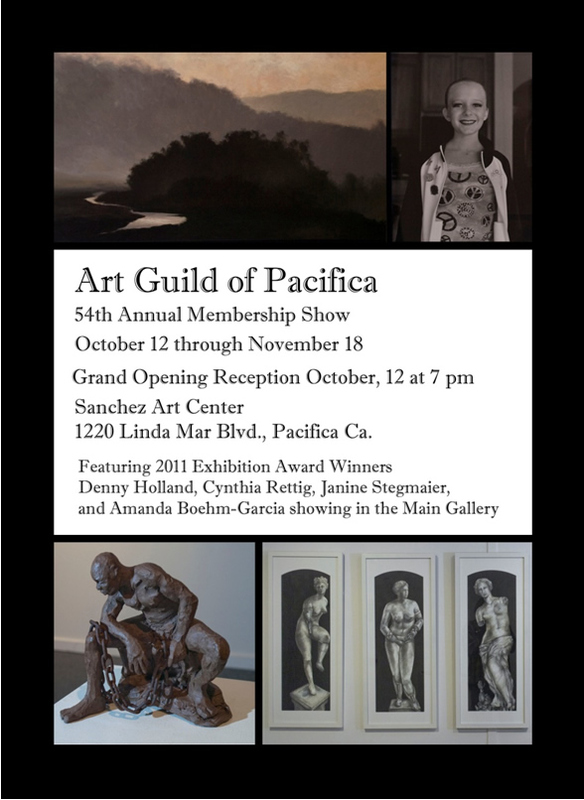 Visit Art Guild of Pacifica at www.artguildofpacifica.org for more information.